The House That Jack Built is one of the strangest tales in British history, and begins with an old lead miner and his wife who took up residence in a remote cave on a windswept beach in South Shields. A pub was built within the cave and a concerted search initiated to find buried Roman treasure hidden in a complex network of underground caves and tunnels. Before long, a desperate battle took place between Peter Allan -South Shields' real-life Indiana Jones -and a coterie of politicians who were determined to find the treasure hoard before he did. Their goal? To bring about a revolution in Italy. Told for the first time, The House That Jack Built reveals the shocking truth behind one of history's greatest untold stories. Although I'm a Jarrovian (my family are from Jarrow and I spent my childhood there), I am officially a Sanddancer as I was born in South Shields. I spent many a Sunday afternoon exploring Marsden Rock and the surrounding caves with my cousins but had no idea of the history of the area...until now. It is quite true that you never really appreciate places that are on your own doorstep; to me, Marsden Grotto has always been just a pub cut into the cliff face. It has always been there and didn't seem to be anything out of the ordinary to the young me visiting Marsden beach every weekend. Now that I am older, I realise what a spectacular setting it is and having read The House That Jack Built, I am gobsmacked that people have been visiting this cave dwelling for around 250 years. The House That Jack Built takes us from the first inhabitant in the 18th Century, Blaster Jack and his wife Jessie, right up to present day in the 21st Century. Chapters are reasonably short and concise, concentrating on one particular period of time, so I found it it a good book to dip in and out of. Although in reality, I was so engrossed in the story of 'The Grotto' that I read several chapters at a time. A good deal of the book is about the legend that Roman treasure is hidden within the caves and tunnels of our beautiful limestone cliffs. I had never heard of this before, but it makes complete sense as the Roman fort of Arbeia is within a stones throw of Marsden Bay. As the Roman Empire began to crumble, I could just imagine the soldiers and their families heading home from our cold and wet island leaving their heavy bags of gold coins behind to collect at a later date. 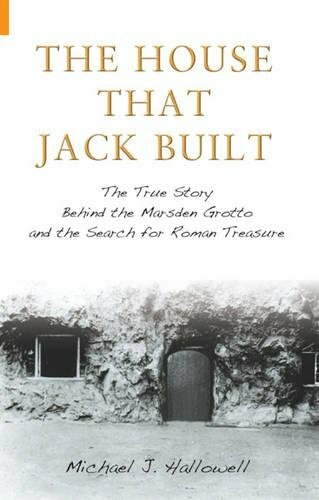 Only it wasn't the Romans that came to collect their treasure, it was the residents of The Grotto, namely Peter Allan and his family, who occupied The Grotto after Blaster Jack. It was Peter Allan who turned the cave into a tourist attraction and often came under the scrutiny of the Excise men as they attempted to catch him selling illegal alcohol. This period of time is particularly interesting as smugglers frequented the cove resulting in stories of fighting and plunder. This also led onto the history behind the reputed ghost in The Grotto; it was one Jibber John who 'jibbed' on his mates to the Excise men causing his ex-friends to string him up and spend the rest of his days in a wooden barrel within the cliff tunnels. Legend says that Jibber John never left The Grotto and he haunts the pub to this day. Absolutely fascinating from cover to cover, I found The House That Jack Built to be a riveting history of Marsden and the surrounding coastline. I learnt so much from this amazing book that I am planning to buy a copy when I return it to the library. Anyone interested in history will find this book entertaining and local history lovers from my native North-East should definitely make sure that they pick up a copy of this fabulous book. Undoubtedly a 5 star read; it's so good I want to read it again!